The European Union has unveiled plans to make more land available for farming in a bid to curb soaring prices of cereals such as wheat. Under the proposal a requirement that farmers must leave 10% of their land fallow would be abolished for one year. The move would increase crop production by about 4%, the EU said. However the proposal has prompted concern from environmental groups that bird and insect populations would be hit by the removal of fallow land. The changes would bring about 10 million tonnes of grain onto the markets, the Commission said, and was therefore essential. "A poor 2008 harvest combined with 10% set-aside would expose the internal market to potentially serious risk," said EU agricultural commissioner, Mariann Fischer Boel. 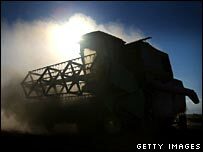 Heavy demand as well as poor weather - from droughts to floods - have pushed up crop prices. On Wednesday, the cost of wheat surged to a record, breaking through $9 a bushel for the first time. It has since fallen back, but the cost of bread is set to increase. If approved by agricultural ministers from member nations, the proposal would have an immediate effect. The "set-aside" rule was introduced in the early 1990s to cut Europe's crop surplus and appease exporters such as Australia. It was set at 10% in 1999. Ms Fischer Boel has said previously that she feels the set-aside policy is an "anachronism". She is expected to recommend its total abolition in a reform paper due in November. Environmental groups say that the abolition of set-aside could leave millions of farm birds without enough food and breeding sites.